(BLACK PR WIRE) – ATLANTA – May 15, 2013 – GMC TV, America’s favorite channel for uplifting family entertainment, presents the original World Premiere Stage Play “Love Will Find A Way”(www.watchgmctv.com/stageplay, #StagePlay), the conclusion of a two-part romantic dramedy starring Christian Keyes (What’s Done In The Dark, Madea Goes To Jail), Gabrielle Dennis (“The Game”), Jason Weaver (Drumline, ATL), Vanessa Simmons (“Run’s House,”Dysfunctional Friends. ), Carl Payne (“Martin,” “The Game”), Shanti Lowry (“The Game,” “The Closer”) and Suveria Mota (Las Pandillas de Los Angeles). “Love Will Find A Way” makes its world television premiere exclusively on UP on Saturday, June 1 at 7 p.m., 9 p.m. and 11 p.m. ET/PT. Based on an original screenplay written by Siddeeqah “Sid” Powell (GMC’s NAACP Image Award nominated “Somebody’s Child”) and directed by Drue Powell (Somebody’s Child, “For Richer or Poorer” Series), “Love Will Find A Way” is a sequel to May’s Original World Premiere Stage Play “What Would You Do For Love.”. UP’s “Love Will Find A Way” is produced by Swirl Films’ Eric Tomosunas, who has produced and taped numerous stage plays and feature-length films for television and DVD, including 35 & Ticking, Love for Sale, A Mother’s Prayer, There’s a Stranger in My House, “Love Will Keep Us Together,” “Love Me or Leave Me,” “The Ideal Husband,” “The Love You Save” and “Sugar Mommas.” Follow Swirl Films on Facebook at https://www.facebook.com/pages/Swirl-Films-Inc/178293836335 and Twitter on @SwirlFilms. “Love Will Find A Way” is the fifteenth original stage play to air in the network’s World Premiere Stage Play series following the success of GMC productions “What Would You Do For Love,” “Love Will Keep Us Together,” “Between Sisters,” “Love Me or Leave Me,” “The Ideal Husband,” “She’s Not Our Sister,” “The Love You Save,” the NAACP-nominated “Sugar Mommas,” “If You Really Love Me,” “For Richer For Poorer,” “From This Day Forward,” “In Sickness and In Health,” “To Love and To Cherish,” and “Community Service.” UP is the only network producing this popular medium and introducing new, original works to a broad television audience. For photos and more information, please go to:www.watchgmctv.com/GMC/LoveWillFindAWayPressRoom. Would you dress your child like this? I was stunned when I came across this photograph of this cute young child on a friend’s page on Facebook. After several booty-popping and twerking videos of children on YouTube and other social media sites, I guess nothing should be a surprise anymore. What say you about this picture of this little boy? Kendrick Johnson, sophomore student was last seen leaving a class on January 10, 2013. His remains were found January 11, 2013 in the school gym rolled up in mats. The Lowndes County sheriff ruled this an accident before the official autopsy report was completed. The family called on NAN to help them bring this issue to light. They have since been rallying in the Valdosta community. On April 18, 2013 the Lowndes County Coroner stated that the Sheriff erred in stating the death was accidental before the autopsy was complete. The Coroner also stated that the crime scene had been compromised citing the body had been moved and that the coroner was called in at 4PM when the body was found at 9AM. The family, NAN, faith leaders and students are calling out for justice. We believe an independent state or federal investigation is appropriate. We are asking you to join us in the fight to justice for KJ. This Saturday, Rev. 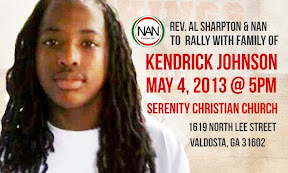 Al Sharpton will be in Valdosta, GA to show support for the family and rally the community. This event will take place at the Serenity Christian Church located at 1619 North Lee St. Valdosta, GA 31602. Doors open at 5PM.